If you have a small garden, no garden or maybe just a balcony, you can still garden and grow a lot of potatoes, you just have to grow them in an old bag, like an old dog food bag or even burlap sacks, like the old coffee grounds come in at coffee shops. I am sure you could pick them up for free if you asked nicely. Obviously this method of growing potatoes is not going to yield the same as potatoes grown in a regular garden but this method works and it works well. I tried this a few years ago with small “new potatoes” and I actually had great success. With a few modifications you can turn an old bag that would normally be thrown away and turn it into a potato growing sac. 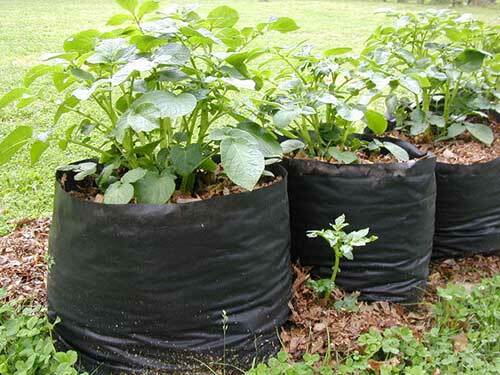 You would have to create drain holes as bags that are made from the tarp materials (like the reusable grocery store bags) are water tight and you don’t want your potatoes to be waterlogged. Check out the video below and see if this would work for you. Here is a link to a written article to get more info.